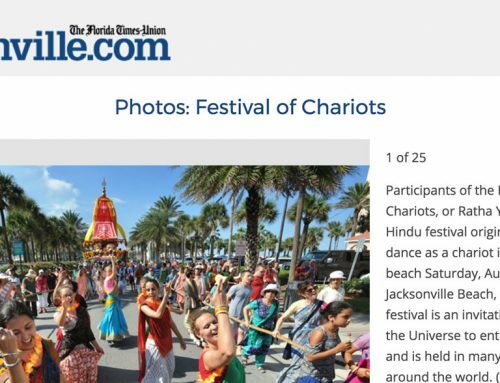 The Festival this year began with the opening cart ceremony around 4pm, which included Catherine Butler, Events Coordinator for Jacksonville Beach and Kristine Hoffman, City Council. Coconuts were broken ceremoniously and auspicious mantras were chanted. “Everyone please take part in the chanting and dancing!” Bhadra Das, the Festival Chairman, exhorted to the crowd. The cart parade, with mridanga drums and kartala cymbals resounding, proceeded down Beach Boulevard and then curved around to the beach. Many beach goers experienced Lord Jagannatha’s darshan and received His merciful glance. Cookies were handed out, as well as books and flyers, while dancing to the infectious Hare Krishna kirtan flanked the cart on all sides. Many that day perhaps had no idea the spectacle they would experience during their beach outing! The Festival of Chariots is an invitation for the Lord of the Universe, Lord Jagannatha, to enter into our hearts by pulling His cart down a beach, street, or anywhere. It is an ancient Indian tradition, brought to the West by A.C. Bhaktivedanta Srila Prabhupada (1896-1977), the founder-acharya of the International Society for Krishna Consciousness. 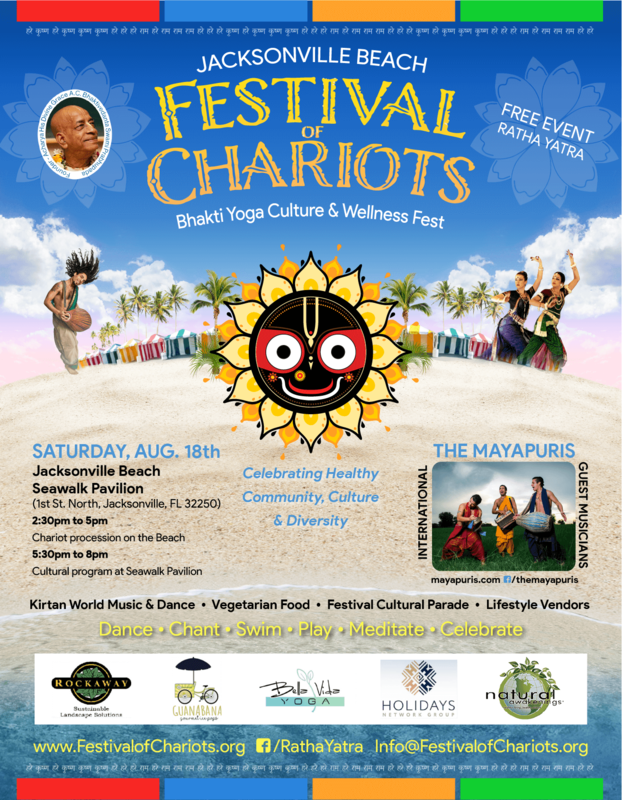 While the cart paraded down the beach, back at the Seawalk Pavilion, the main event venue, stage kirtan and various booths greeted visitors. Booths this year included books, Krishna conscious art, explanations of the Vedic Cosmology, Cow Protection, Henna, and others. Nine vendors joined in our booth display, including crafts, massage, jewelry, and construction. 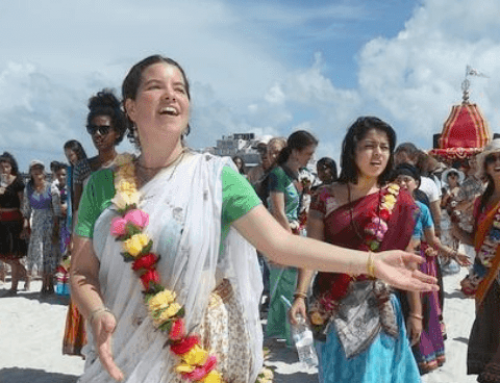 During the stage kirtan, various bits of philosophy were explained to the guests, such as the meaning of the Hare Krishna mantra and our identity as spirit souls. “Mantra is a way to free the mind, better than through drugs, and a way to overcome anxious thoughts,” Tulsirani, one of the MC’s, quipped to the crowd. Vegetarian prasadam, or sanctified food, was served throughout the event. 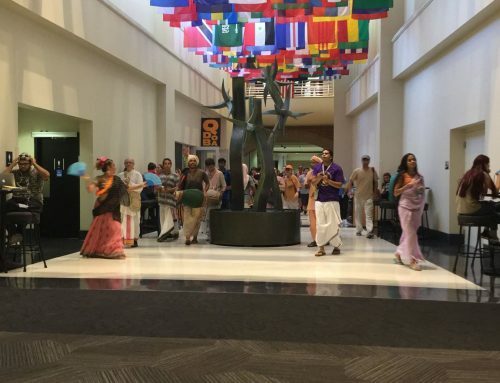 Upon the cart’s return to the pavilion, the cultural stage program included chanting by The Mayapuris and traditional Indian dancing, Bharat Natyam.